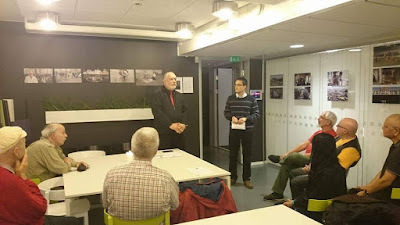 Stockholm -- The ILGCN's (rainbow culture international) and Bears International's 1st Nordic Rainbow History & Art Month stage in the Swedish capital has been completed with seminars, performances, poetry, film screening and art and photo exhibitions. This followed the Month's first 2 days in the northern Swedish city of Umeå October 1,2 and is to be followed in turn by the last 3 days in the Lithuanian capital of Vilnius October 29-31. Special guest speakers were Vilmos Hanti, Budapest-based president of FIR --the international anti-facist organization , David Veres -- chairman of the European Rainbow Humanists., Ulf Andersson, editor of Sweden's Amnesty Press, Colin de la Motte-Sherman -- secretary general of the ILGCN History Secretariat-Berlin and Andrus K. co-secretary general of the ILGCN Eastern European Secretariat-Minsk. Brazilian ILGCN cultural ambassador Anders Ödvall made a moving tribute to the life and songs of Brazilian gay singer, Renato Russo, who died of AIDS exactly 20 years ago. Amanda Walkabout of Sweden and Apila Miettinen of Finland presented their Nordic-supported campaign "Lilies of the Streets" against prostitution and trafficking of both young men and women, and Swedish journalist Ivar Andersen and photographer Christofer Hjalmarsson provided a powerful description of the violence-filled realities facing gays in Afghanistan. The Stockholm stage also focused on history and rainbow culture of Iran, Kurdistan, Kyrgystan, Kazakhistan, Hungary, Poland Sweden, Lithuania, Finland, Latvia, Estonia, the U.K., Iceland, Russia, Belarus and Ireland as well as on the media, elderly, refugees, trans, bisexuals, HIV/AIDS, sports and Bears both in the Nordic region and beyond. The Stockolm stage of the history month was supported by the Nordic Association - Sweden, Tupilak (Nordic rainbow culture workers) and Nordic Rainbow Humanists, and included the 2nd stage of this year's ILGCN international conference following stage 1 in Palanga, Lithuania last June..
ILGCN's "Clio's Silver Cup" history awards were handed out in person to pioneer film maker Marie Falksten of "Eva and Maria" fame, and LGBT book shop "Medusa" creator, Karin Lindequist -- both of Sweden. ILGCN's new award for international film making "Wings" -- named after the exactly 100-year-old film by homosexual Swedish film maker, Maurice Stiller -- went to Maria Binder from Germany, and the ILGCN"Sappho in Paradise" literature award went to Greenlandic author Niviaq Korneliussen for her "Homo sapienne." ILGCN's "Arco Imago" went jointly to Denmark's Birthe Havmöller for her art/photo archive,"Feminine Moments" and the Danish/Estonian-run "Nordic & Baltic Queer Art Network. Latvia's openly gay Foreign Minister Edgars Rinkevics has received the ILGCN Rainbow Warrior 2016. Bears International announced its first "Bear Art 2016" awards going jointly to art photographer, Luke Darko of Paris and London-based artists/curators Mike Wyeld and Charlie Hunter. "We're proud finally to join other cities running LGBT History Months such as Budapest, Edinburgh, London and some American cities," says Bill Schiller, secretary general of the ILGCN Information Secretariat - Stockholm and Tupilak's international secretary." "We're looking forward to the month's final three days in Vilnius and hope that next year´s Nordic History & Art Month will expand to include additional Nordic cities." "Because of the 0-budget status of our Stockholm event, we are thankful for the free-of-charge venues provided by the Nordic Association, the local of the PositHIVa gruppen, the Secret Garden and Side Track pubs and Salon Lugo," Schiller concludes.